Get Happy Feet By Using These Super Hydrating Products! Considering your feet do all the hardwork, keeping you up and running every day; they deserve some serious loving! Unfortunately, they are the last to get any attention. Maintaining baby soft, clean feet does not mean you get a pedicure every few days. It’s actually as easy as taking 10 minutes out of your weekly routine and give them some TLC. 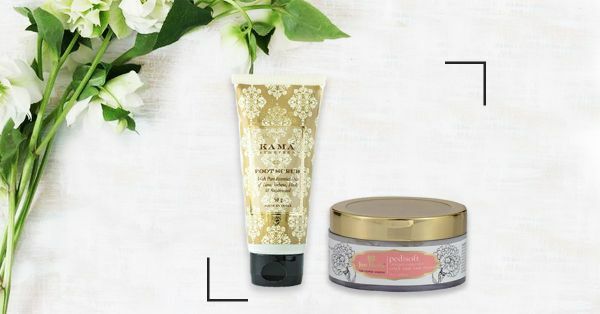 A foot scrub, a foot mask and a deodorizer, we’ve got it all for you...*THESE* foot care products are everything you need for happy feet. A quick fix for exceptionally chapped feet, this foot mask from this K-beauty fave brand is everything you need in colder months. In time, it will get rid of dryness and flaky skin. To make it more effective, we recommend scrubbing and exfoliating your feet before applying this one! This foot cream is made of Vitamin E enriched, which rids your feet of dullness, and cocoa butter which moisturises. It also has Peppermint Oil & Mango Butter to nourish your heels. This is a mask meant for your hands and feet. A combination of humectants like glycerin and bentonite and kaolin clay to draw out any dirt trapped in your skin. Keep your hands and feet tan-free and glowing with this one. Use it once or twice a month to maintain the clarity of your skin. This foot scrub cleanses, exfoliates, and relieves tired feet. It has ground apricot shell powder which makes it strong enough to exfoliate and gentle enough to NOT be abrasive. Tea tree, chamomile, sandalwood and basil heal, purify and brighten your skin. An amazing blend of ‘just herbs’ this calendula peppermint foot cream will get rid of your those cracks and dead skin and restore cracked, rough feet. Just soak your feet in a tub of warm water, slather on this cream and put on some warm socks. You’ll wake up to happy feet, promise! Say goodbye to foot odour with this refreshing foot mist. Spritz it on whenever your feet feel tired or grumpy. Organic ingredients like lemongrass and grapeseed along with peppermint help soften and deodorise your feet. This peppermint enriched foot cream restores, re-hydrates and works on your dry skin and heels while you snooze. Slather on a generous amount and put on a pair of socks and catch up on your beauty sleep. Oh, it smells AMAZING! Perfect to relax yourself after a long day at work. The marigold foot soak cools down your body heat, relieves sunburn and muscle soreness, moisturises and de-tan’s feet. Sounds like a treat right? Give your feet enough TLC, they are going to support you all through the shaadi season!